Very happy with the battery. Good starting power. Good price. Easy to identify the right battery. The price was ok. Ordering was a doddle. It arrived in about 2 days. Fitting was easy. It worked just like it said on the instructions. What more can you ask for? Quick delivery and charge. Bike started first time after chnaging in the new battery. 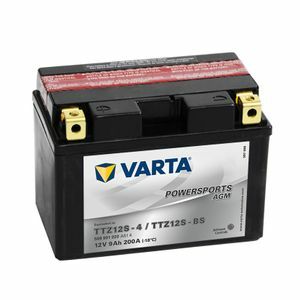 This battery is excellent; it came with full detailed instructions on set up and installation,which was easy, and our bike started up instantly when the battery was fitted; it is still giving great performance and is fully sealed so no worries about leaks. Excellent value, well worth the money. What can I say.... Excellent service. I ordered the wrong battery, customer services were second to none. As soon as they received the returned battery, the replacement was sent immediately and I received it within 2 days!! I shall definitely be using you again. Thanks.